Boil vermicelli in one and half cups water with a little salt and a tsp of oil.If you don't get roasted vermicelli heat one tsp oil in a pan and roast the vermicelli until it turns to slight brown in colour. Boiling takes about three to four minutes.Add half cup milk stir well and switch off the stove and allow it to cool. When it cools it would have absorbed all the milk like shown in the picture. Add a little more salt if required and add thick curds. Heat oil in a pan crackle mustard seeds switch off stove add chopped ginger,green chilli,asafoetida and curry leaves. 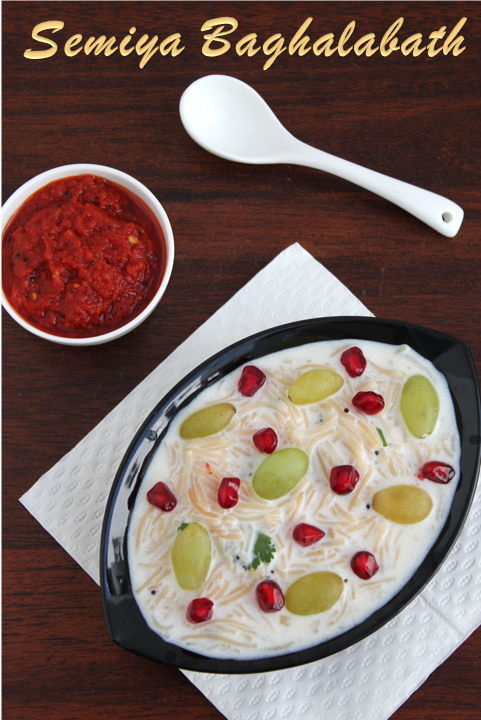 Pour over the cooked vermicelli and mix well.Add chopped coriander leaves. 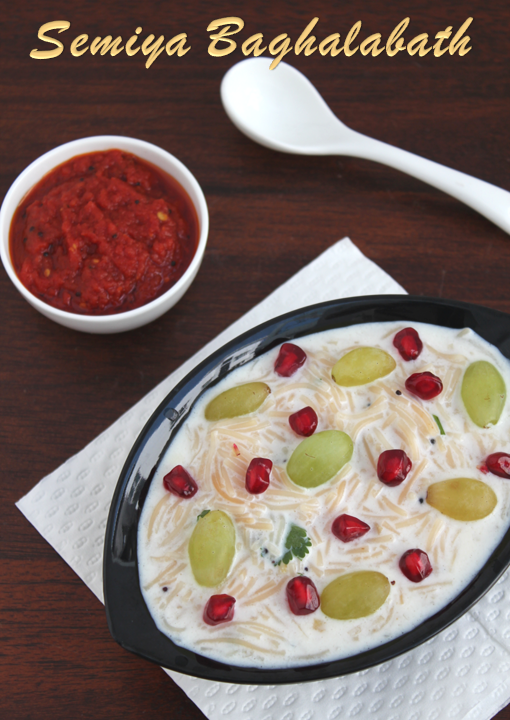 Garnish with green grapes,pomegranates and enjoy with pickle. Hi! I am regular visitor to ur blog...ur recipes are so easy to follow..to the detail.even the complicated dishes sound easy when u show them step by step. I always wanted to make bagalabhath only dint know the correct procedure..your recipe is so easy to follow especially with those wonderful clicks...Many thanks and all the very best !!! Never heared of this before.. Sounds very interesting. Looks yummy like the Annapurna Thayir semiya. Good clicks. Nice meeting through blogging.